How Big Does A Siberian Husky Get? / How Big Does A Siberian Husky Get? Siberian Huskies can be so small and cute as puppies, but how big does a Siberian Husky get? The AKC Siberian Husky Standard quotes an acceptable range for an adult male to be between 21 and 23.5 inches tall (53 to 60cm) and weighing 45 to 60 pounds (20 to 27kg). Females are a little smaller, between 20 and 22 inches tall (51 to 56cm), and weight between 35 and 50 pounds (16 to 23kg). However this is the AKC standard, and of course dogs sometimes exceed this. Some people report Huskies growing to 100 pounds (45kg) although this would be an extreme and could suggest an overweight and under-exercised dog! In comparison a male Golden Retriever is 23-24 inches tall and 65-75 pounds, and a male Labrador Retriever is 22-24 inches tall and 65-80 pounds. That is to say the Husky is a touch shorter and lighter, but not by much. Huskies can expect to live for 12 to 15 years, but they have reached adult height more or less by the end of their first year. From then on they increase mass as muscle builds up around their frame. That means the little cute puppy you see at the breeder is going to grow real fast in the coming months. Obedience training is a must to control your dog, and with Cesar’s Way training courses there is no excuse to give it a go. Also consider the size as it relates to grooming. Being a larger dog with a double coat, Huskies will shed a LOT of fur each year and leave it EVERYWHERE around your house and garden! 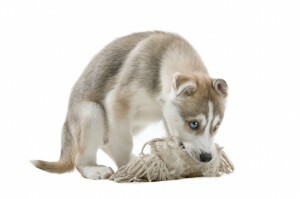 Keep this in mind if considering a Husky puppy for your household and you like your place to be spotless. Some selective breeding has developed a smaller Siberian Husky called the Alaskan Klee Kai. These range from toy size (9 pounds in weight, 13 inches tall) to miniature (10-15 pounds, 15 inches) to a standard (16-23 pounds, 17 inches). Because they are a relatively new breed from a smaller gene pool, the breed is still being developed and are relatively rare to see out and about. They share many of the traits that full sized Siberian Huskies exhibit: shedding, an abundance of energy, and a life span of around 14 years. Expect prices from breeders to be at a premium because of the rarity – think $1000+ for a puppy. The smaller size is likely to increase in popularity over time but it will take a number of years of experienced breeding to develop a population of healthy Klee Kais. In addition there is a Miniature Siberian Husky which you can read about in detail in a separate article. These are essentially a smaller Husky, sharing similar behavior and temperament to a standard husky, bit much smaller! So there you go – Siberian Huskies will grow almost to the size of a Golden or Labrador retriever, and they will grow very fast in their first year of life. Keen to learn more about the breed? Check out our breed information articles that cover all you need to know about Huskies and their characteristics.